Joan Marie Dawes, 85, Bristol, VA, went to be with the Lord on Wednesday, April 10, 2019 at James H. Quillen VA Medical Center in Johnson City, TN. She was born in upstate New York and graduated from Crouse Irving Hospital School of Nursing in Syracuse, NY. Joan joined the US Navy in 1958. Her career spanned from the Korean War through the Vietnam War. She spent her entire career as a nurse, taking care of wounded soldiers. Following her retirement from the Navy, she continued nursing, caring for babies in the neonatal ICU in Bremerton, WA. 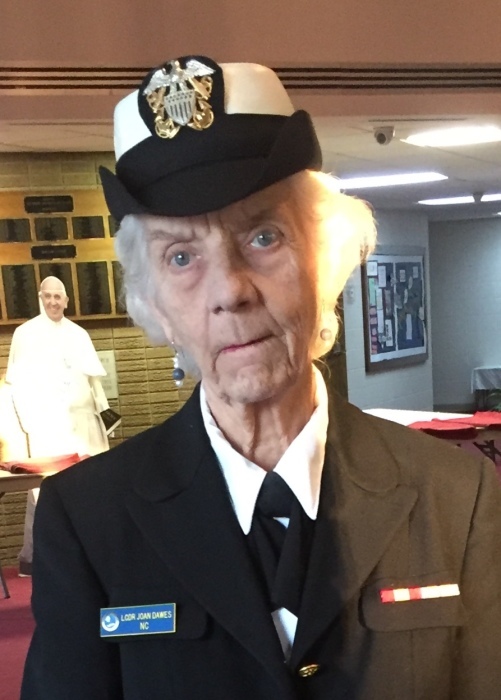 She later retired and moved to Bristol, VA. After retirement she served with several Veterans organizations in the region as well as volunteering at the Hospice House in Bristol. Joan was a lifelong Catholic and loved her church, St. Dominics, in Kingsport. She served the church in many ways, singing in the choir, and baking and sewing vestments for all of the new priests. She was preceded in death by her parents, Roy Francis and Helen Margaret Dawes; brother, Joseph Dawes; sister, Sarah Dawes; and brother-in-law, Vernon Drake. Joan is survived by her sister, Jean Drake; brother, Thomas (Dona) Dawes of Utica, NY; and countless nieces, nephews and cousins. Special thanks to the staff of James H. Quillen VA Medical Center CLC unit and a special thanks to family and friends that helped her through the years. A celebration of life will be held at 2:00 pm on Saturday, April 13, 2019 at St. Dominics Catholic Church with Father Emmanuel officiating.